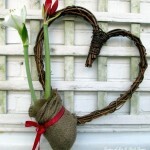 It is a balmy 32 degrees Fahrenheit today, perfect for switching the winter windowboxes over for Valentine’s Day! 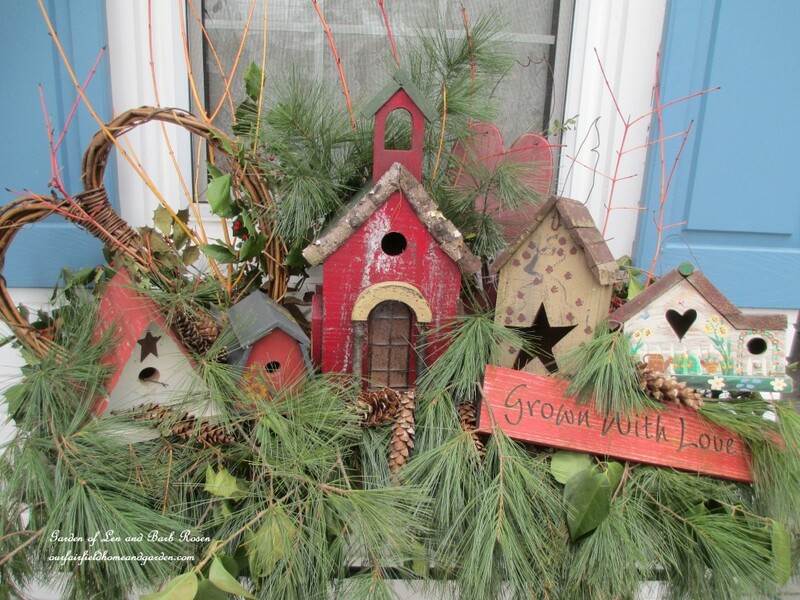 As I was thinking up a design for these Valentine’s Day Windowboxes, my first order of business was to salvage the winter greens and keep it simple. Can you tell I’m not so crazy about the cold? So, leaving the winter greens intact and adding birdhouses, some hearts and a few additional natural cuttings became my plan. Red Twig Dogwood, more pine cuttings and pinecones were all I needed to add. I zoomed around the yard pretty quickly, snipping merrily, then went to work. Within 45 minutes I had both windowboxes finished, just as my hands started really getting cold. Time to get inside and make a pot of hot chocolate! 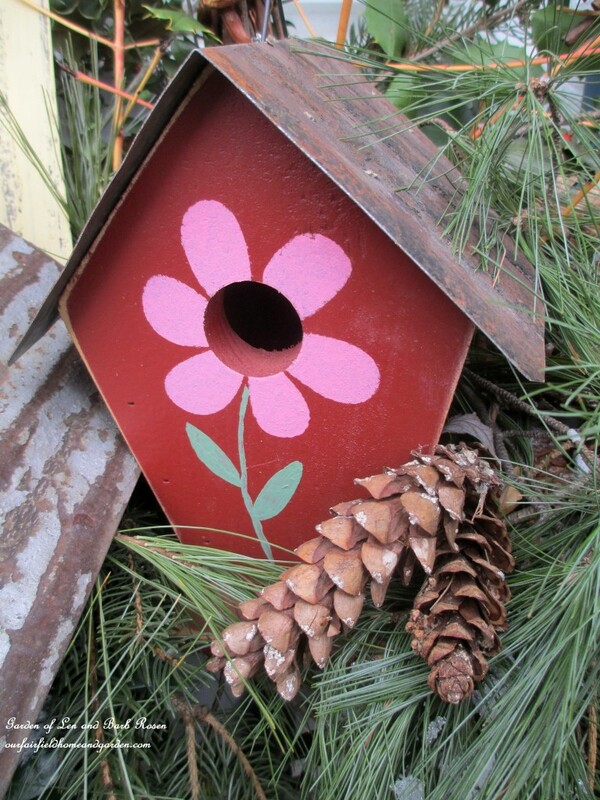 Here’s a lovely new birdhouse my sweetie-pie just bought me as an early Valentine’s Day present! I love the little painted flower around the entrance. Because I am such a bird nut, friends and family always know what to get me for any occasion, a birdhouse! Looking through my collection, I found quite a few had some red on them somewhere, making them perfect for these Valentine’s Day Windowboxes! 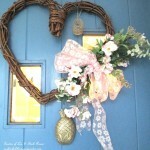 After scrummaging around, I also came up with two heart grapevine wreaths bought for pennies at summer garage sales and a couple wooden heart wreaths. I even snagged a magnet birdhouse board from our garden room since it was a birdhouse shape and had a bright red cardinal magnet on it! 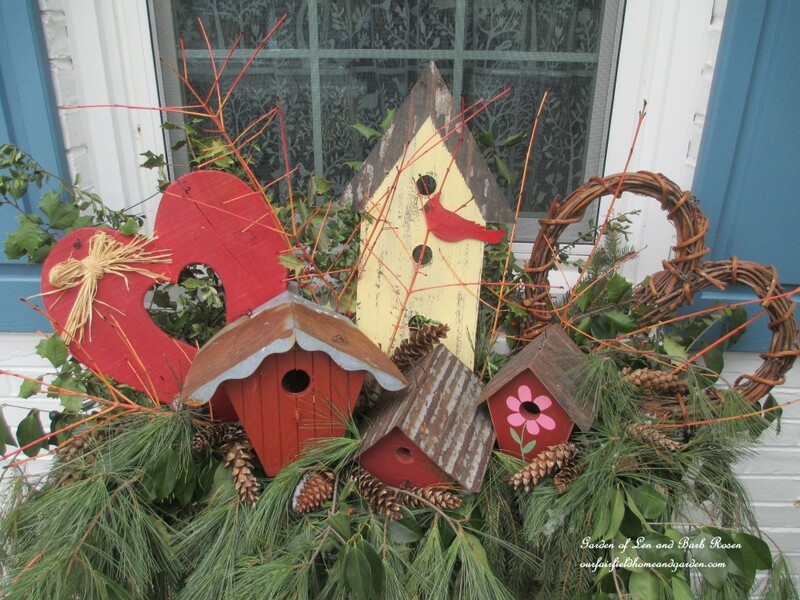 Red Birdhouses for Valentine’s Day! 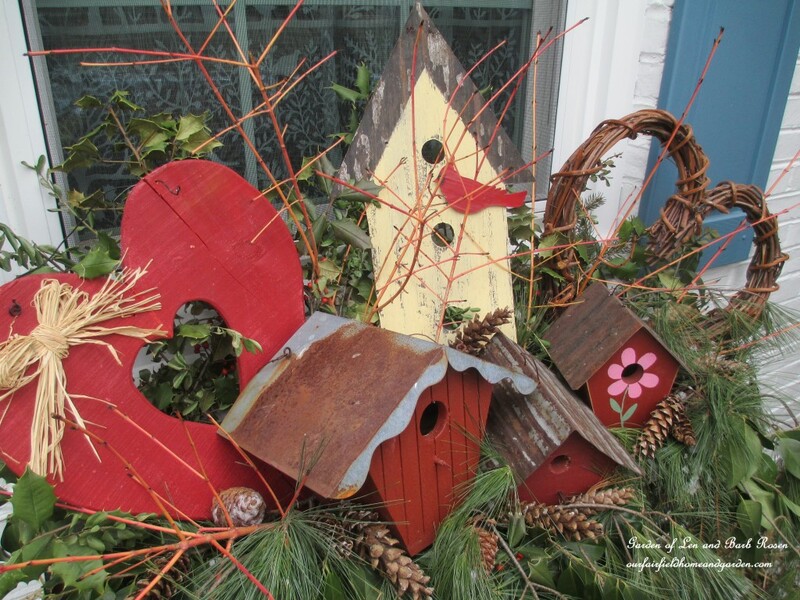 Valentine’s Day Windowbox with red birdhouses, a magnetic board with a cardinal magnet and two hearts. Here’s the windowbox on the other side of the house. 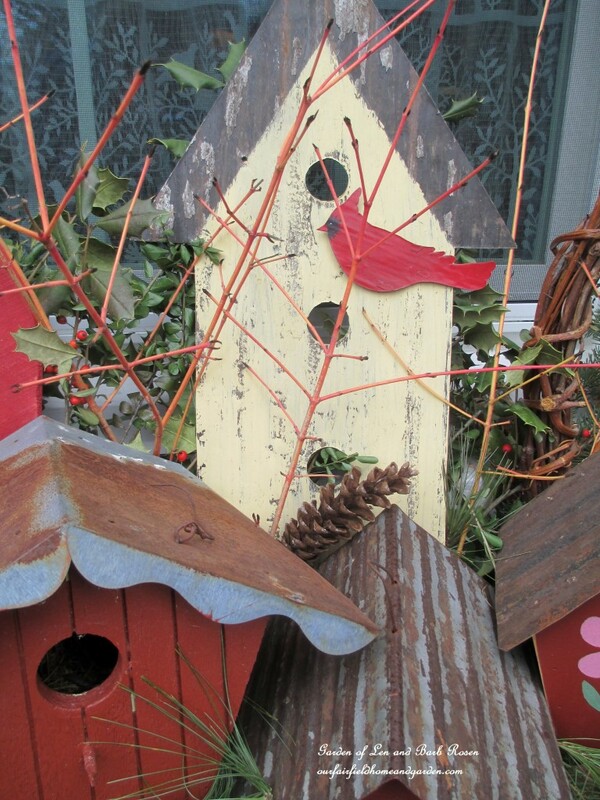 Thank goodness I have a ton of birdhouses with some red on them to complete the theme with two big windowboxes! 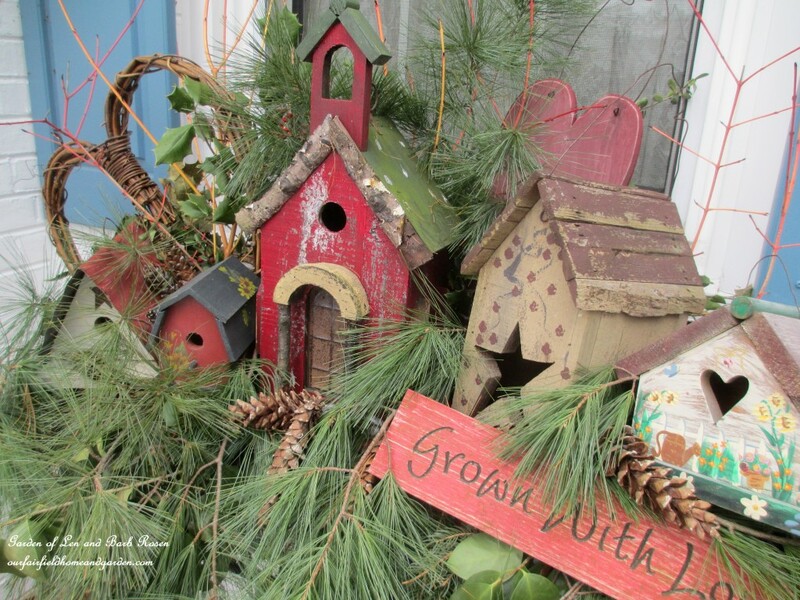 Valentine’s Day Windowbox with birdhouses, greens, grapevine and wooden hearts! 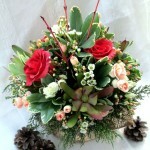 Here are a few more posts from Our Fairfield Home and Garden to get you in the mood for Valentine’s Day! I absolutely adore this idea. Wish I could get to my window boxes to dress them up (too much snow right now). Thank you, Heather! I waited for a relatively warm day to get at them! Timing is everything in winter! Fun winter ideas. We don’t seem to be having winter in California this year!